Mornings can be a chaotic time for any family. Especially if you have young children. We have four kids, ages (almost) 4, (almost) 5, 8, and 9. So how do we get through our mornings? I must say that routine and structure play an important role in our day, and it helps make our mornings run smoothly too. Most of the time. Here's a look inside a typical morning at our house. My husband and I wake up early, hopefully before the kids. 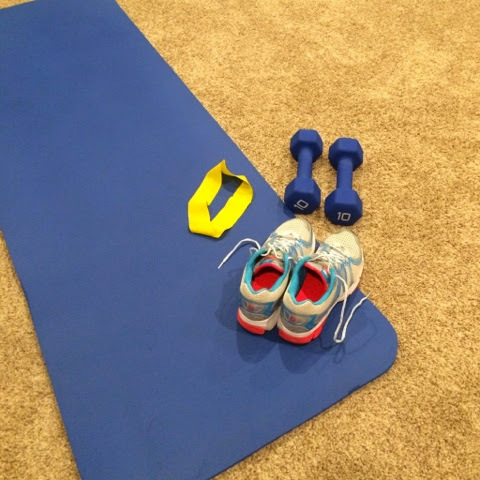 We put in our exercise DVD and workout for 30-60 minutes. 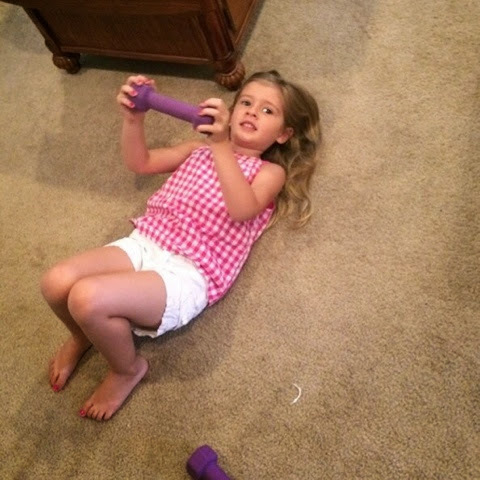 Personally, I find it easier to workout without the kids around. If they do happen to get up while we are exercising, they usually end up needing us to be parents to them rather than allowing us to be adults taking care of ourselves. Meaning that we have to tend to their needs rather than our own. However, the flip side of them watching us exercise is that they see us working on healthy habits for ourselves. They see our dedication to exercise each and every morning. They see that it is part of our routine. I love catching them imitate exercising through play during the day. What a compliment to our lifestyle. After our exercise routine, we shower and get ready for work. The kids are in the routine of getting themselves dressed. The older kids help themselves to a selection of healthy breakfast items (GirlyGirl almost always has oatmeal, and Bubs usually has cold cereal). The little girls still need some help with brushing teeth and hair, and maybe a little encouragement to get dressed rather than play. :) The littles eat their breakfast at daycare, so that is one less thing for us to worry about each morning. We don't do big, fancy breakfasts, but if you are interested in some delicious healthy ideas, check out Aloha for tons of great ideas. You could easily modify them to meet your special diet needs. In order to decrease the feeling of being rushed in the morning, I try to make the older kids' school lunches (and my salad for lunch at work) the night before. That way I can just throw everything into lunch boxes in the morning on our way out the door. Preparation is key to reducing stress. Especially in the morning. To sum it up, we begin with exercise, get dressed and ready for the day, and pack lunches and school folders before heading out the door for the day. The kids know exactly what is expected from them each morning, and things usually run smoothly. Now, we do have the occasional meltdown from who-knows-what or tears from tangly hair, but overall, our mornings run pretty smooth and easy. My hope is that this type of routine will carry into the middle school and high school years. Right now my kids are young enough that they wake up on the own (usually) before 7:00 am. But once those teenage years hit, I'm dreading having to drag them out of bed. I'm hopeful that with the firm foundation of a morning routine, things will transition much more easily. Tell me about your healthy morning habits. "Preparation is key to reducing stress." Words to live by!